It turns out the saddest scene in Jurassic World: Fallen Kingdom was actually inspired by not one, but two different Steven Spielberg classics. It was previously revealed and pretty obvious that the brachiosaurus death scene that takes place during the movie was inspired by the original Jurassic Park. Now, director J.A. Bayona has revealed that the scene took some cues from E.T. the Extra-Terrestrial. J.A. Bayona has been pretty active on Twitter leading up to and ever since the release of Jurassic World: Fallen Kingdom. Often times, it was just to thank fans or to help promote his latest movie. In some cases, he would reveal fun little facts and interesting tidbits about it. In this case, he posted a gif of the terribly tragic brachiosaurus death scene and explained that the look of the shot was derived from E.T. Here’s what he had to say about it. It’s sort of an interesting movie to take inspiration from directly, considering just how sad this scene is. No matter how you feel about Jurassic World: Fallen Kingdom as a whole, watching that brachiosaurus disappear in a cloud of smoke and fire as Isla Nublar is wiped off the map is terribly sad. E.T. famously has his chest cavity light up in the movie and that clearly served as the visual reference J.A. Bayona used for this moment. It’s also not the only moment in the movie that was inspired by E.T. 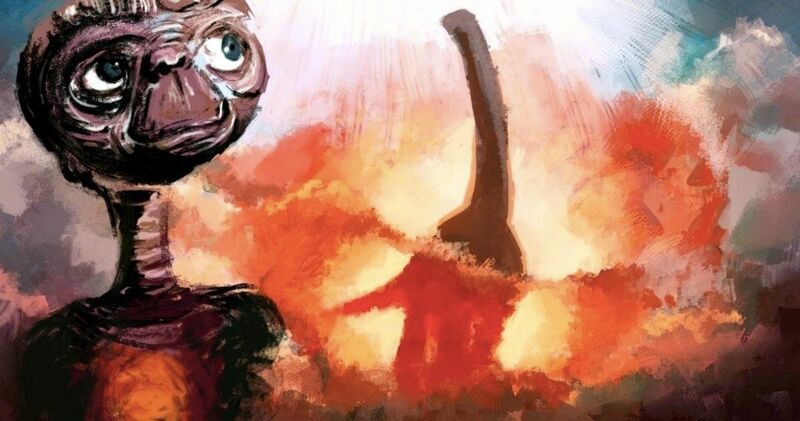 The director previously revealed that the final shot with Blue overlooking a suburb from the mountains was actually the same suburb in which they shot E.T.. There is also an E.T. toy hidden in Maisie’s room in the mansion. Fans of the Jurassic Park franchise were extremely happy in 2015 when the first Jurassic World made its way into theaters, after a 14-year dry spell caused by Jurassic Park III. That movie has its detractors, but it was generally well-received and wound up grossing $1.67 billion at the box office. Jurassic World 2 has also found financial success, bringing in $1.26 billion so far. However, critics and fans alike seem to be much more divided on this entry. Overall, it didn’t seem to be nearly as well-liked on a broad scale. Like it or not, Jurassic World 3 has already been given the green light and is set for release on June 11, 2021, with Colin Trevorrow returning to the director’s chair. Clearly, there is still a lot of money to be made here and a story that needs to be wrapped up. Jurassic World: Fallen Kingdom is set to arrive on home video on September 18, for those who liked it enough to own it. You can check out the post from J.A. Bayona’s Twitter account for yourself below. Topics: Jurassic World 2, E.T.